The PelGar Rat Station is environmentally friendly being made from recycled plastics and is fully recyclable in normal household waste. The Rat Station is hinged on the right-hand side to allow for full opening while the bait station is in place. 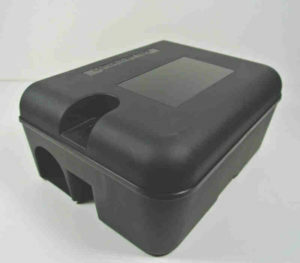 Manufactured with security in mind it features a wall bracket which the bait station clips onto. The PelGar Rat Station has been designed with rat behaviour in mind. It has a textured ‘non-slip’ floor which gives it a more natural feel. There are full width openings for easy access and a small lip to prevent water entry and drainage holes in the floor for when the weather conditions get particularly adverse. The PelGar Rat Station is supplied with a glass reinforced key for extra strength and durability. When it comes to bait placement the PelGar Rat Station is very versatile. The two bait reservoirs each comfortably hold 100g of loose bait such as grain or pellets while vertical and horizontal bars can be added to secure blocks and pasta bait. The Rat Station will also house a ‘break-aback’ trap with two location clips in the centre of the station, and a hole on the other side allows the trap to be set with a cable-tie without opening the box. A copy of the PelGar Rat Station promotional leaflet can be accessed here.